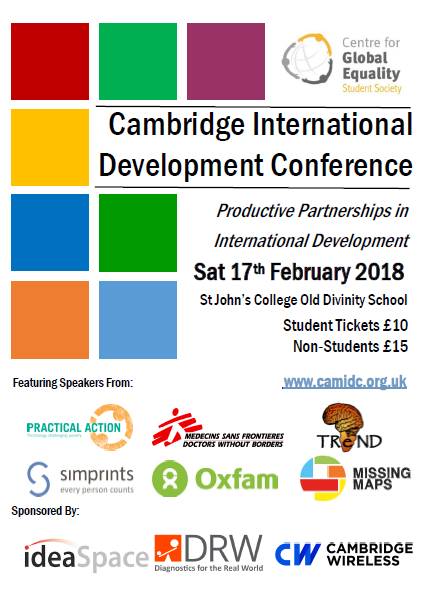 The eleventh Cambridge International Development Conference (CamIDC) is taking place on Saturday 17th February, at St John’s Old Divinity School. The theme of the conference is ‘Productive Partnerships in International Development’. The day brings a diverse array of scholars and experts in the field of international development in contact with interested members of the Cambridge community. The conference aim to challenge assumptions, encourage new connections within the field, and inspire delegates to engage with issues in this field. The day has 4 sessions across 2 rooms (2 speaker sessions, 1 panel session, 1 breakout session) making 8 panels and presentations in total. There is also a coffee break, lunch, and a networking hour at the end. See the speakers here. The connecting thread of it all is the emphasis on ‘productive partnerships’: How should international organisations work together? Why have local partnerships been historically neglected? How can we even measure whether a partnership is productive? These types of question, and a focus on critical analysis, are the guiding force of the day. We hope you are able to join us. Thanks to the generosity of our sponsors, we have been able to keep our standard tickets at the early-bird price. Tickets are £10 for students, and £15 for non-students. This includes conference ticket, tea and coffee, lunch, and the networking hour with wine. Lunch includes 5 types of sandwiches (with a vegetarian and vegan option) garnished with crisps and salads, a selection of assorted cakes (including lemon curd slices and quinoa brownies), and danish pastries. The Cambridge International Development Conference is a student-led, non-profit initiative, run by the Centre for Global Equality Student Society. We are grateful to our sponsors: ideaSpace, Diagnostics for the Real World, and Cambridge Wireless.